MANILA, Philippines, January 2, 2018 — World Youth Alliance Asia Pacific (WYAAP) appoints Joyce Ann Cedeño as the new WYAAP Regional Director of Operations (RDO). Cedeño was born and raised in Manila, Philippines. She graduated with a degree in Consular and Diplomatic Affairs from the De La Salle – College of St. Benilde in 2013 and is currently completing her Master’s Degree in Development Policy. Cedeño became a WYA member in 2013 and joined the Regional Internship at the WYA Asia Pacific office. During that time, she organized events such as the Coffee House Session “A Night of Rhymes” and the Emerging Leaders Conference. She also represented and introduced WYA to different universities and colleges in the Philippines and Indonesia. After her internship, Joyce continued to volunteer for WYA and became a lead facilitator in the 2015 WYAAP Summer Camp. She believes that WYA brings out the best in young people by helping the youth realize their voice in social matters. And while she still has a long way to go and has a lot of things to learn, that’s what she aims to help accomplish in her capacity as RDO. 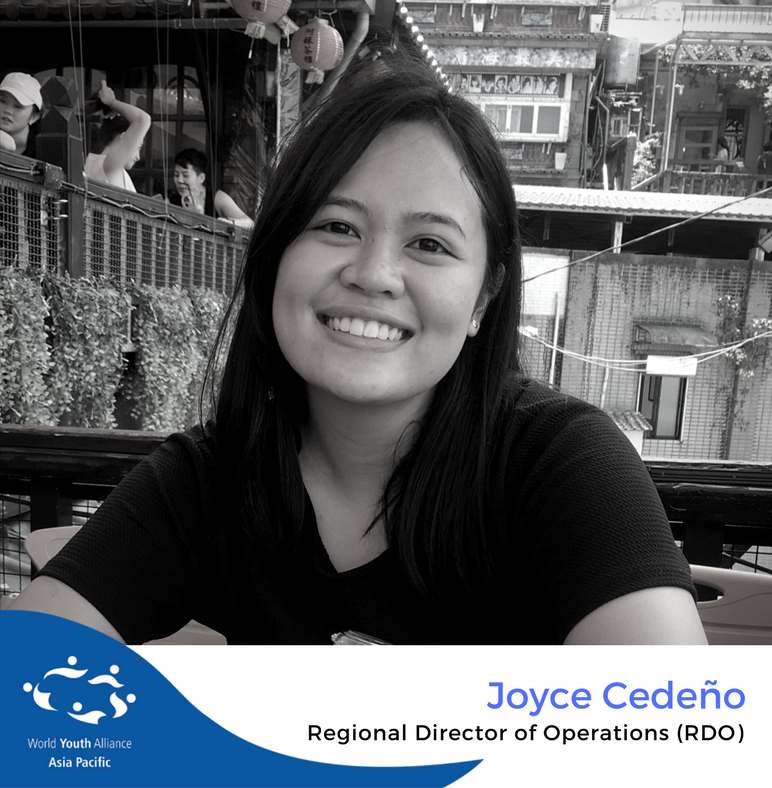 Prior to being selected as WYAAP Regional Director of Operations (RDO), Cedeño worked for Action Against Hunger and the Korea International Cooperation Agency Philippines respectively. As current WYAAP RDO, she will be handling internal operations for the regional office and will manage the online Certified Training Program, Internship Program, and the Human Dignity Curriculum.